Newsletters are posted to all resident’s on The Dover Court Estate as well as the surrounding areas. 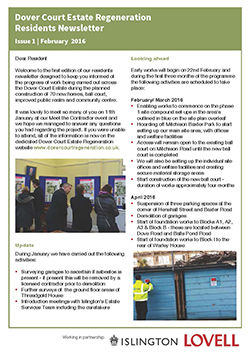 Newsletters will be sent out periodically to ensure all resident’s are kept up to date with the latest progress, community engagement and up coming works. Click the link below to download Spring 2019 Newsletter. Click the link below to download Christmas 2018 Newsletter. Click the link below to download Winter 2018 Newsletter. Click the link below to download August 2018 Newsletter.